Spring can be a challenging time of year, at least in the DC area. The weather jumps around like crazy, sometimes it’s under 50, and a day or two later it can be over 80. The mornings and nights are cold, but the afternoons are delightfully warm. All I want to do is embrace the sunny warmth, but cold winds make dresses and skirts a bit premature. Well this soup, is perfect for this awkward winter-spring transition. 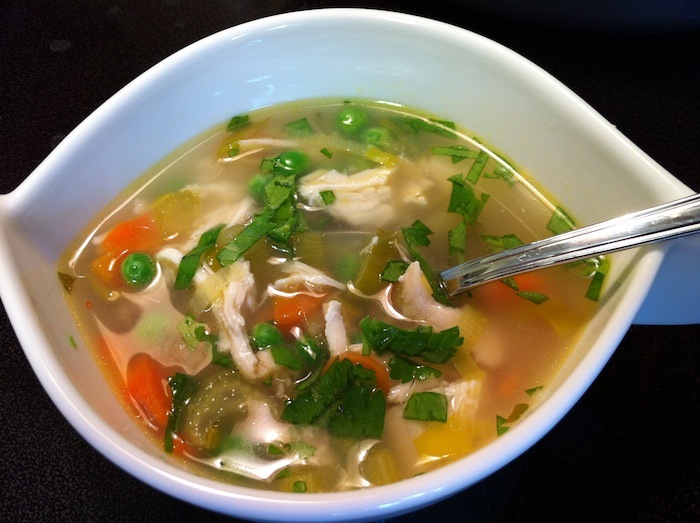 It has the warmth and comfort of a winter soup, but the light freshness of a summer dish. Lemon keeps it sparkly and new, while frozen peas add a bright pop of color and sweet spring flavor. One bite of this had me ladling up a bowlful in no time. It’s super easy to throw together, and would freeze well too. This would also be a comforting bowl of delicious if you happen to catch a springtime cold. I started this by cooking the chicken breasts in the oven at 350° with a drizzle of olive oil and a good sprinkle of coarse salt and pepper on both sides. It took about 25 minutes maybe, but basically when I was ready to add them to the soup they were cooked all the way through. In a large soup pot, heat olive oil over medium heat. Sauté the leeks until soft, and then add carrots and celery. Sauté the vegetables until soft, sprinkle with a little salt and pepper while you wait. Add chicken broth, lemon zest and juice, and bay leaves. Bring to a boil, then reduce to a simmer. Add chicken and heat through. About 5 minutes before serving, add frozen peas and allow to just heat through before serving. Taste and adjust seasoning as needed. Serve and garnish with minced parsley. Enjoy!